My easy trifle recipes from scratch produce rich and decadent desserts. How about a strawberry trifle or a creamy double chocolate trifle? Even when asked to bring a dessert at the last minute, these easy recipes for trifles will be perfect to take. 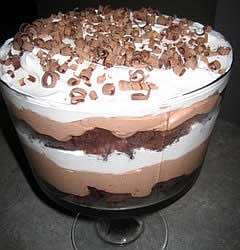 If you love chocolate, you must make this easy trifle recipe. In a medium bowl beat the milk and pudding mixes together until it begins to thicken. Place 1/3 of the pudding in a bowl and set aside. Place the remaining 2/3 of pudding in another bowl. Dissolve the instant coffee in the hot water and add to the 2/3 of pudding. brownie layer, syrup, candy bar pieces, coffee pudding mixture, remaining whipped cream, last 1/3 of the candy bar pieces and syrup drizzled over the top. This is another one of my easy trifle recipes and every time I serve it, I am asked for the recipe - see for yourself. In a 9x13 in pan, bake cake according to package directions. Cool and crumble. Place the instant pudding in a mixing bowl and beat with the sweetened condensed milk and regular milk. 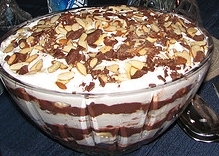 In a large trifle or other glass serving bowl, place half of the crumbled cake on the bottom. Then pour half of the strong coffee over the cake, and spread half of the pudding over that. Top with half of the whipped topping, sprinkled with half the crumbled candy bars. Repeat layers in the same order. Refrigerate until serving. This easy trifle recipe has a few steps, but is to worth it. Beat together until soft peaks form. If you want it sweeter, just add more powdered sugar. Whisk both of the instant pudding mixes with the quart of milk until smooth; set aside. For the homemade whipped cream - in a large bowl, whip cream, vanilla and sugar until stiff peaks are just about to form. First for the bottom, layer half of the angel food cake cubes, half of the blueberry sauce, half the vanilla pudding, half the whipped cream, and half the crushed graham cracker crust pieces in a trifle bowl. Repeat with the remaining cake, pudding, and whipped cream, and top with the remaining crushed graham cracker crust pieces. Chill well in the refrigerator before serving. In a saucepan, combine the sugar and cornstarch. Stir in the lemon juice and water until smooth. Add the blueberries and bring to a boil over medium heat, and cook until smooth - or approximately two minutes. Cool slightly and serve warm over ice cream or pancakes; or refrigerate. Place the strawberries in a large bowl and pour the sugar over all. Let sit for a couple hours to create juice. Cut the cake into small bite-sized cubes and set aside. In a bowl, whisk the milk and water together. Add the instant pudding mix and beat for 2 minutes. Let stand for 2 minutes or until soft-set; fold in the homemade whipped cream. Spoon a third of the pudding mixture into a 4-qt. trifle or glass bowl. Sprinkle a third of the graham cracker crumbles over the pudding and top with half of the cake cubes and sliced strawberries and juice. Repeat layers once. Top with remaining pudding mixture. Garnish with whole strawberries and leftover graham cracker crumbs. Chill completely before serving. No time to make a homemade dessert? This easy trifle recipe fits the bill. Luscious tasting and put together in no time - it just needs to chill in the refrigerator before serving. PREHEAT oven to 350 degrees and grease a 9x13 inch pan for the brownies. Set aside 1/2 cup halved mini peanut butter cups for the garnish. Prepare the brownies according to package directions and add the cup of peanut butter chips into the batter. Bake in prepared pan for 20 to 24 minutes. Cool and cut into bite-sized pieces. In a large mixing bowl, use your mixer and beat the milk and instant vanilla pudding mix for two minutes. Add peanut butter and vanilla and mix well. Fold in 1-1/2 cartons of the whipped cream. Place 1/3 of the bite-sized brownie pieces into the bottom of a large glass bowl. Layer with 1/3 of the remaining peanut butter cups and 1/3 of the vanilla pudding mixture. Repeat this two times. Cover the trifle with the remaining 1-1/2 cartons of whipped cream and garnish with the peanut butter cups you set aside. Drizzle with chocolate sauce and chill for at least 4 hours before serving (if you can wait that long).